Interesting lawsuit against VMware regarding their use of Linux in ESXi » Welcome to vSphere-land! « Has VMware jumped the shark? I came across this one a few weeks ago and thought it was interesting. In a nutshell one the biggest contributors to the Linux kernel (Christoph Hellwig) is trying to sue VMware over GPL (General Public License) violations from VMware taking the Linux kernel and modifying it for use with their own ESXi vmkernel. As you may know VMware has longed used the Linux operating system in both the ESX & ESXi hypervisors. ESX used a almost full-blown Linux install as part of the Service Console and ESXi used a smaller and streamlined Linux shell called BusyBox that serves as the console for ESXi. 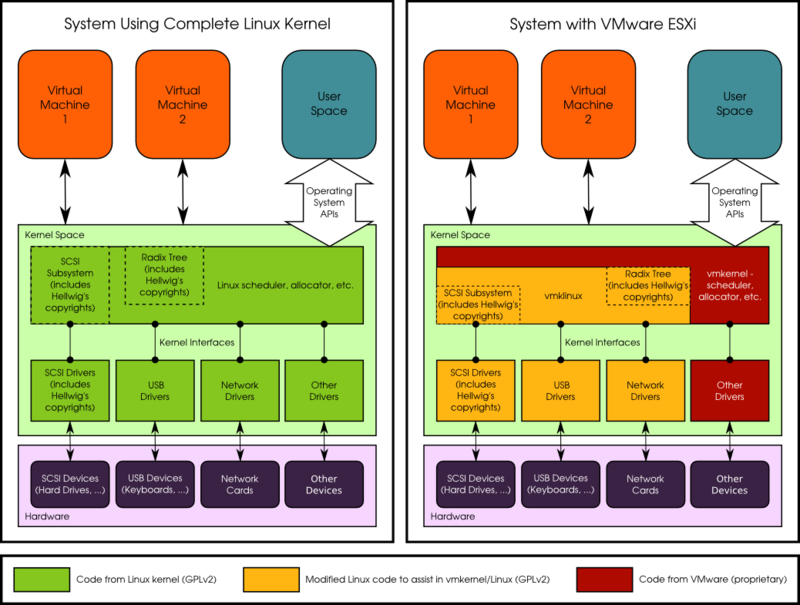 VMware essentially took the Linux code and modified it into their own module that they call vmklinux. From reading through the documents that are published it’s not completely clear what they are wanting from VMware. It looks like they are trying to get VMware to publish the complete source code for vmklinux or quit using it entirely. Apparently VMware has requested all court documents not be released to the public as it contains many examples of their source code. It appears that they have a pretty strong case against VMware but I can see this one dragging on for many years and by that time VMware may have dumped the Linux code for something else that they developed. You can read about the latest court updates that occurred a few weeks ago in this blog post from someone who attended it. You can read the whole FAQ on the case from the SF Conservancy that provides a good overview of the case and is an interesting read.